Past items from our What's New web page. 28 January 2010 - Boston MA: With the cooperation of four outstanding organizations Boston Meet WILL take place on 21-22-23 May 2010. 12 January 2010 - Kevin Farrell - Boston MA: The Boston Meet run by Kevin Farrell announced for April of 2010 has been CANCELLED. 7 January 2009 - From Q-Car Company, Inc. Bangor, Pa.: Due to the dollar devaluation, and the increased costs associated with the manufacture of motors, anything powered by an electric motor in our line has increased $3.95 per motor effective immediately. This is just a cost pass along, and does not contain any markup. Should the cost of motors go down we will reduce the cost of powered trucks accordingly. We regret the increase; we are doing everything we can to try and hold prices stable, but this was beyond our control. Place an order of $50.00 or more between August 15, 2009 and September 15, 2009, and receive a 20% discount and FREE SHIPPING. Free shipping applies to Domestic US and Canadian orders only. Insurance is still optional and not included with this offer. It can be purchased separately. This offer is being extended three days until the 18th of September. 20 August 2008 - From Q-Car Company, Inc. Bangor, Pa.: We had a little sticker shock yesterday at the price of epoxy. When last we bought it, which would have been about five years ago, it was just about $35.00 a gallon. The new price, depending on the brand is now $29.95 to $65.00 a QUART. We have already been paying six times more for the metal filled epoxy we use for our cars then we did when we first started casting cars. We could reduce that cost by blending raw epoxy with the higher cost metal filled variety. Blending also improved casting quality. We will still blend - but not for cost savings. Those days are gone. Expect considerable price increases on anything made from epoxy. 12 July 08 - From Q-Car Company, Inc. Bangor, Pa.: You can now pay with your credit cards for Q-Car orders by using PayPal. 15 Jan 08 - From Q-Car Company, Inc. Bangor, Pa.: Due to unprecedented demand for some of our Street Details, we are experiencing some unexpected out of stock conditions for these parts. Our products were mentioned in the February 2008 issue of Classic Toy Trains (pg. 59) that we were not made aware of in advance. Had we known we would have increased stock of these products in anticipation of that increased demand. We apologize for any inconvience this may cause but rest assured stock will be replaced as soon as possible. As is always the case here at Q-Car backorders are shipped at our expense. If you would like to check availability of any item please contact us via email. We will set parts aside for you if we know you will be sending an order for something in short supply. 30 Jan 07 - From Q-Car Company, Inc. Bangor, Pa.: Here we go again! 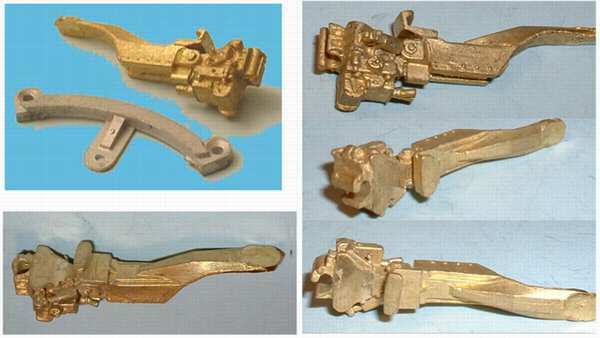 Lost Wax Casting prices are on the rise. As new stock comes in it is coming in with significantly higher prices. So prices of ALL lost wax parts are subject to change without notice. 1 Jan 07 - From Q-Car Company, Inc. Bangor, Pa.: We are holding prices stable for the near future. But that doesn't mean they will be stable for any extended period. Raw material prices continue to increase, and those prices affect what we purchase. 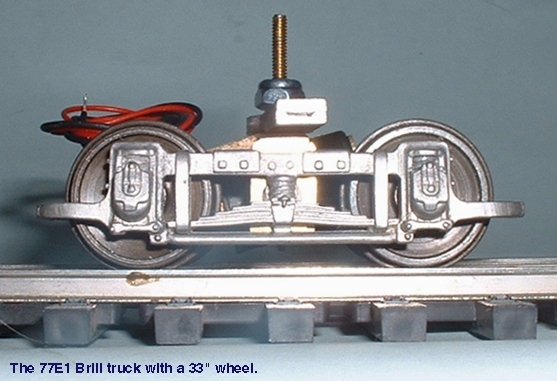 6 Sept 2006 - From Q-Car Company, Inc. Bangor, Pa: Deliveries of powered trucks has been slowed by a delayed motor delivery.. Motors were promised for late August, and they will not arrive until the second week of September. Your patience is appreciated. Demand has been consistently high this year and we would like to thank you for your continued support of our products. Parts sales are up; a good indication that scratch building continues. So although we have fewer car & kit makers today the hobby has continued to thrive on stashed kits, and a very talented group of modellers who will make what they want - kit or no kit. 9 Feb 2006 - From Q-Car Company, Inc. Bangor, Pa: SPECIAL NOTE: Brass prices are going to the moon. Today we received word that on our re-order for 79E lost wax frames the new price is about 42% higher than last October. That will add $12.80 to the price of the lost wax 79E. We will hold the current price of $112.70 until 1 March 06. At that point the price for the lost wax 79E will be $125.50. Frames sold separately have already increased in price. A further caution is that because of this new development prices for ALL lost wax items are subject to change without notice. 21 Jan 2006 - From Q-Car Company, Inc. Bangor, Pa: The Birney car is out. Tony Tieuli has sent us a photo of the Steinway Lines version. According to Tony Corgi has "hit a home run" with this car. It looks pretty good to us. See our 1 July 2005 note below about power trucks for this car. 18 Jan 06 - From Q-Car Company, Inc. Bangor, Pa: We would like to announce the availability of a new underfloor truck. This unit is limited at the present time to a 15-1 ratio and 26" through 36" wheels, and wheelbases of 64" or larger. The 26" and 28" version needs a minimum wheelbase of 72". There is also a maximum car weight of 14 ounces. Using this truck on cars with weights exceeding this limit will void any warrantee. It is primarily designed for the very lightweight St. Petersburg cars where cutting through the floor is undesirable. Trucks are currently available, and being shipped. Trucks are ONLY for outside hung frames. 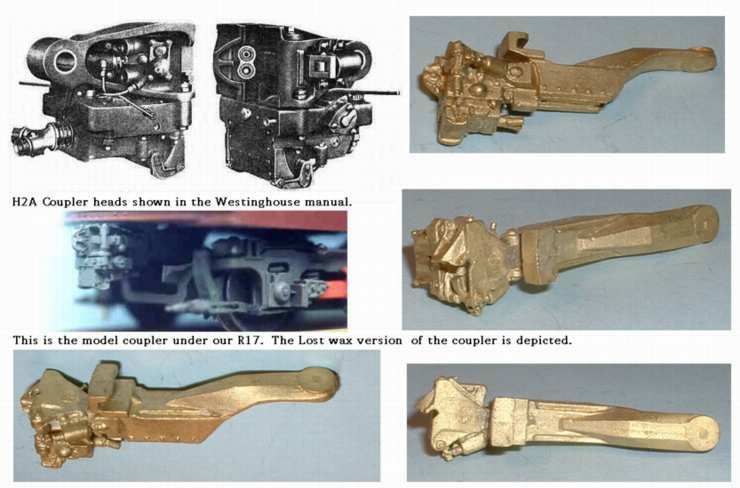 PCC and LRV trucks cannot be made this way. If you would like to see Tony Tieuli's extensive evaluation and test data for this truck design please Click Here. 1 Jan 2006 - From Q-Car Company, Inc. Bangor, Pa: We are announcing a price increase effective 1 January 2006. Prices have increased approximately 3%. And because specific components in the truck manufacturing sector have had increases of their own Truck Prices, and truck related products have increased a little higher. 17 Nov 2005 - From Q-Car Company, Inc. Bangor, Pa: Due to an error in packaging CB361, CB362B , and CB362C have been sold at below market prices. They were packed as pairs, but were charged as single units. Effective immediately prices for these items has increased to $23.30 per pair or $11.75 EACH. 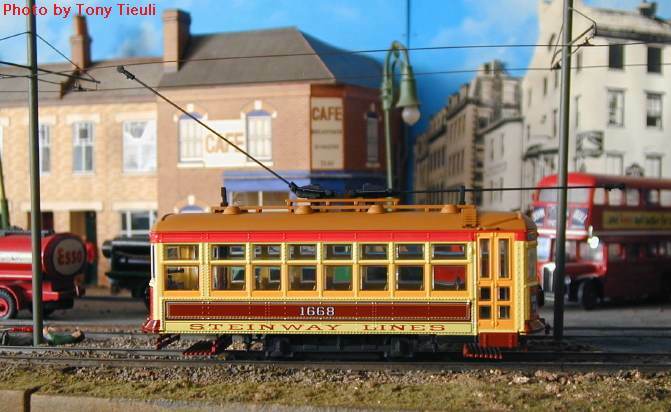 29 July 2005 - From Q-Car Company, Inc. Bangor, Pa: Trolley Talk has been sold to Peter Weiglin. The new address is: Trolley Talk, PO Box 206, Amelia, Ohio 45102-0206. Peter is a long time traction fan, and an early supporter of Epoxy cast cars. In May of 1973 Peter was one of my first customers to buy a new at the time "epoxy" cast car; a Brooklyn 8000 number 8008, and then again in July of that year 8017 and 8018. Our thanks goes to Andrew (Drew) Sack, Jr. for running the magazine in an exemplary fashion, and seeing to it that is has a promising future with Peter. 1 July 2005 - From Q-Car Company, Inc. Bangor, Pa: With the announcement that Corgi will be releasing the single truck Birney, we have been getting questions about powering that car. Yes we do have the correct truck, the 79E Brill with 26" wheels is the proper truck and it is available in lost wax brass, or white metal. Check the Truck Pricing page for cost. 1 January 2005 - From Q-Car Company, Inc. Bangor, Pa: Effective 1 January 2005 prices have increased. Prices listed at this web site reflect this increase. As always, any orders on hand prior to 1 January 2005 will ship at the old prices. New 2005 paper catalogs are available and we ask that you check the home page of the web site for the current catalog price if you need one. 16 December 2004 - From Q-Car Company, Inc. Bangor, Pa: All seats are back in stock, INCLUDING THE CS077 HIGHBACK PLUSH SEAT. However, the CS066 Rattan seats are going fast. 1 January 2004 - From Q-Car Company, Inc. Bangor, Pa: We will no longer insure shipments as we have in the past, unless you opt to pay for that coverage. Effective for January 2004 we will only confirm shipments for the rates listed on our Shipping Charges page. Insurance is at your option. MTH has announced it will be releasing the R-1-9 Series cars in their Premier Line. Since there is no need for two companies making the same car, and the fact that our project has been re-scheduled more times than we care to think about, we have canceled it. We apologize for any inconvenience this may cause but considering MTH's announcement this was the only logical course to take. 16 September 2003 - From Q-Car Company, Inc. Bangor, Pa: We have a need for a contract white metal spin caster to do work for us. If you have a spin casting facility or if you know of a reliable quality shop that does this work we would appreciate hearing from you - contact@qcarcompany.com. 8 September 2003 - From Red Brea Shops: Fred Oakland has informed me that his business Red Brea Shops has been sold. 5 December 03 - CS272 Taylor HLB Sideframe with a 6' 1" wheelbase - White Metal Version. 10 Nov 03 - From Q-Car Company, Inc. Bangor, Pa: - CB265 TMER&L M35 AB, 72" Sideframe with a 6' wheelbase. The lost wax version is in stock. 3 June 03 - From Q-Car Company, Inc. Bangor, Pa: CS271 50E Brill Sideframe with a 6' 6" wheelbase. 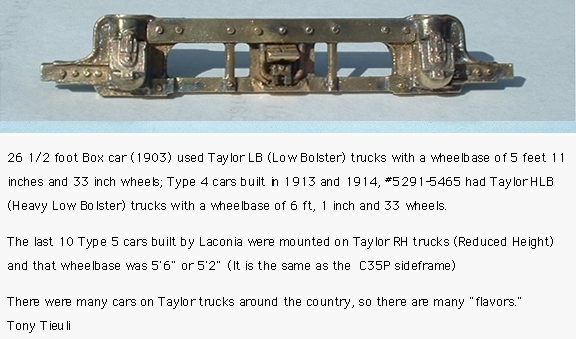 Just click on the photo of the frame to see the complete truck set. This frame is available in brass and white metal. 1 November 2002 - From Q-Car Company, Inc. Bangor, Pa: The price we pay for epoxy, (the main ingredient in our car bodies) has increased a whopping 15% in a one year period. Added to this are the new shipping requirements our supplier is forced to conform to when shipping chemicals to us, we are charged an extra fee for each chemical we receive to produce our car bodies. As a consequence, prices for our car bodies will increase. 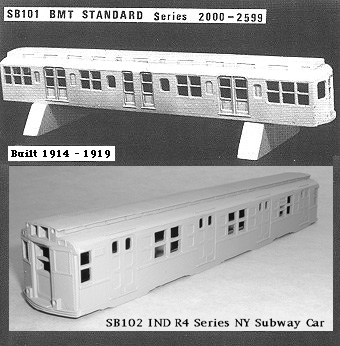 We have reached an agreement with MTS Imports to cast in resin plastic our SB101 BMT Streamlined Roof Standard, and our	SB102 IND R4 New York HO Subway Cars	and they will be sold exclusively by MTS Imports as painted ready to run cars. For more details about the cars please contact MTS Imports. 3 May 2002 - From Q-Car Company, Inc, Bangor, Pa: Our web site is now located at qcarcompany.com. Due to space limitations at our old site we had to make arrangements to find more space. So we are now at our own web location, with enough space to expand for the next few years. 23 Aug 2001 - From Northwest Short Line, Seattle, Washington: The 1220 (Small Can Motor) Magic Carpets MC I and MC III (MT016 & MT016B) are available once again.